Remember the book A Wonderful Year by Nick Bruel? Me neither. It was the first book I reviewed on this blog on February 20, 2015, and I don’t think I’ve looked at it since. Three days later I posted a review for The War That Saved My Life by Kimberly Brubaker Bradley, a book I still book talk many times a year and count among my favorite books of all times. That’s the way it goes with reading. Some books are just more memorable than others. So when I realized that I’ve published almost 1,400 reviews, I decided it was time to do some weeding. In a week or so, I’m going to take down the reviews from 2015 and 2016. In preparation for this, I’ve gone through all the books I’ve written about and picked out the ones I feel have stood the test of time. I’ve compiled them into a book called Hit the Books: The Best of Kids Book A Day, 2015-2018. There are about 150 books included; each entry has the summary I wrote on my blog and why it was included on the list. 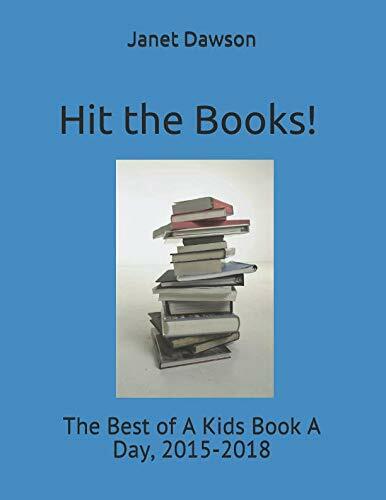 They’re divided into eight sections: picture books, early readers, early chapter books, middle grade fiction, graphic novels, poetry, biography, and nonfiction. I also put together ten lists of “Read-Alikes” from the books I’ve reviewed on the blog. So if you have a fan of Diary of A Wimpy Kid or Raina Telgemeier, you can get some ideas for other books they might want to try. Let me know if you find this book helpful. Who knows, I may put together a second edition in another year or two! Summary: When a group of boastful knights regale each other with slightly exaggerated tales at the Round Table, Merlin sends them off on a mission to slay the Terrible Lizard. 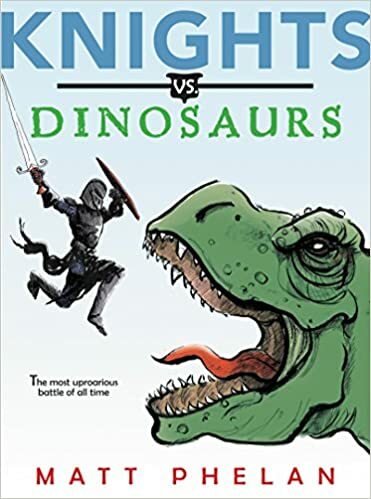 Knights Bors, Hector, Erec, and the mysterious Black Knight are joined by squire Mel on a quest that unexpectedly takes them back in time to the days of the dinosaurs. There they have one adventure after another with spinosauruses, triceratops, and more, all the while seeking the tyrant king, Tyrannosaurus Rex. Along the way, some surprises are revealed about the knights and their squire, and they slowly learn to stop competing and start working as a team. After they finally meet and defeat their enemy, they learn that Merlin has been up to his old tricks, but they can’t help being pleased with the results. 160 pages; grades 2-5. Pros: With lots of illustrations and a few comic-style pages, this would be a good choice for those still getting their feet wet in the chapter book realm. There’s plenty of humor and a couple of unexpected strong female characters. Cons: I probably didn’t appreciate the humor as much as, say, a nine-year-old might. 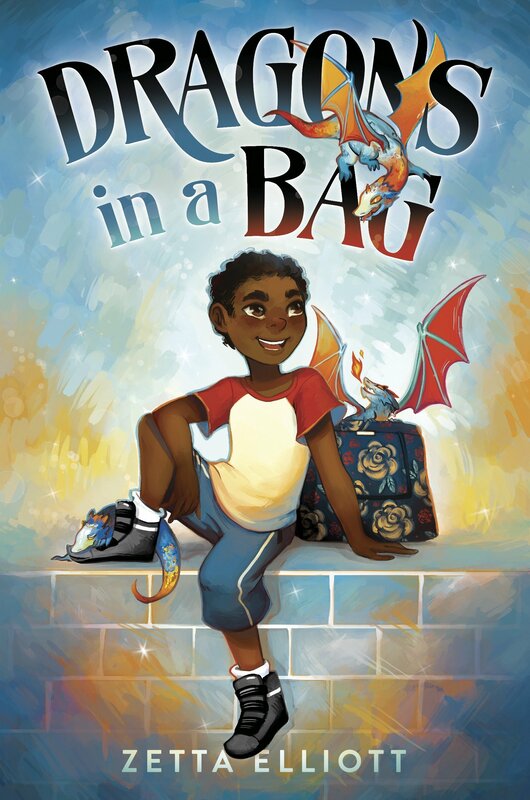 Dragons In a Bag by Zetta Elliott, illustrated by Geneva B. Summary: Jaxon’s not happy when Mama has to go to court to fight their eviction and drops him off with a strange and somewhat unfriendly older woman. He can’t help but feel curious, though, when she receives a mysterious package from Madagascar that seems to contain something alive. Before long, he learns that the woman, Ma, is a witch with a long-term connection to his mother that Jax never knew about. He gets drawn into a fascinating world of magic, meeting an unusual cast of characters that includes his long-lost grandfather, and finds out that Ma’s mysterious package contains three tiny dragons. When he and Ma travel back in time, though, things start to go wrong, and Jaxon fears he may have ruined everything. By the time Mama returns, he’s found a way to begin to fix his mistakes and has agreed to become Ma’s apprentice. His mother isn’t thrilled with this turn of events, but an invitation from Ma to move in with her sets the stage for an interesting sequel. 160 pages; grades 3-6. Pros: This would make a good first fantasy book–the magic is fairly straightforward and the book is fairly short with quite a few illustrations. Kids will relate to Jaxon as he tries to figure out the strange circumstances he is thrust into, and will be curious to find out what happens to him and his new dragon friends. Cons: It felt like the story was just getting going toward the end; here’s hoping the sequel will be out soon. Summary: The Professor teaches at the University of Mice, located behind the shelves of a bookstore. One day, a new student named Pete approaches him with a request for help in finding out more about an ancestor who supposedly lost a treasure at sea. It’s unclear whether or not the ancestor went down as well. 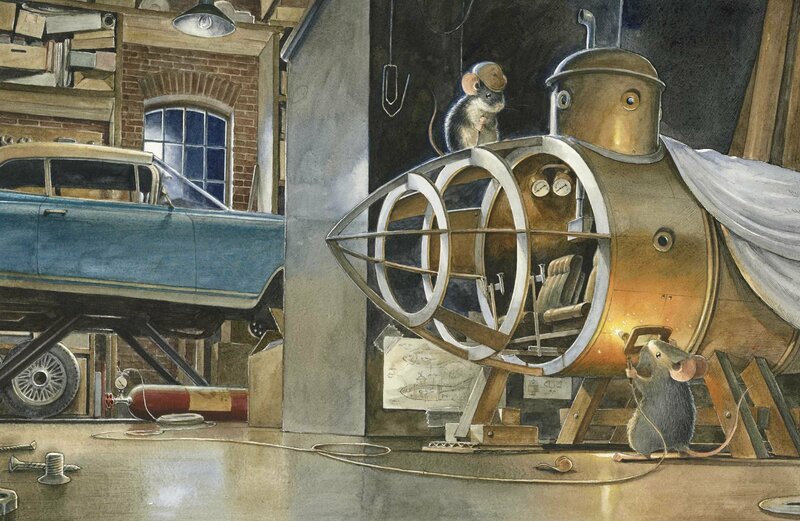 The Professor is reluctant to help much at first, but when he discovers Pete experimenting with a submarine, he gets caught up in the adventure. After many trials and occasional missteps, the two of them manage to create a sub and two diving suits. Hitching a ride on a cargo ship, they travel to the spot where the sunken boat lies. They’re able to launch their submarine and go aboard the ship, where they discover the treasure–Pete’s ancestor’s journal. 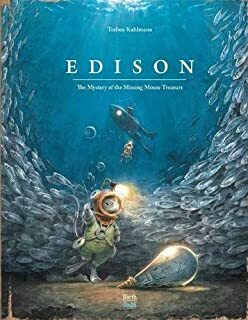 They learn that he created the light bulb, then managed to get to America where he was able to share his plans with Thomas Alva Edison. And the rest is history–for both mice and humans. Includes historical facts about the history of the light bulb and Edison. 112 pages; grades K-4. Pros: I’ve somehow missed Kuhlmann’s other books on famous mice (Lindbergh and Armstrong), but was enchanted with this book, particularly the illustrations. The details of the mouse world and their creations are amazing, and the hard work and serendipity required to come up with a successful invention are well documented. This would be a great read-aloud, allowing plenty of time to take in all the artwork. Cons: The story and writing aren’t as strong as the illustrations. Summary: Chase and Ava are at a flea market with their parents when they discover a mysterious suitcase. The woman who sells it to them acts kind of odd, and when they buy it, a man chases after them to try to get it back for himself. Inside are several artifacts, including what they think is a dragon doorknob. It leads them back through time to Camelot, where they meet up with Merlin and discover that Arthur is in danger. Turns out the dragon is no ordinary doorknob, but actually the hilt of Excalibur. 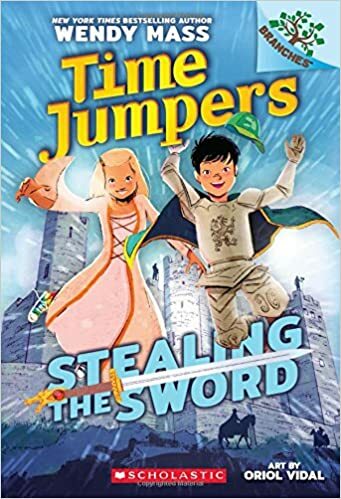 The two children prove instrumental in reuniting the sword and its hilt just in time to save the king. The man from the flea market shows up again, still after his suitcase, but the kids manage to elude him and return to the present. The other artifacts in the suitcase, as well as the pictures on the back cover, assure readers that there will be at least three more books in this series. 96 pages; grades 1-3. Pros: There’s plenty of action in this latest entry from the Scholastic Branches imprint. 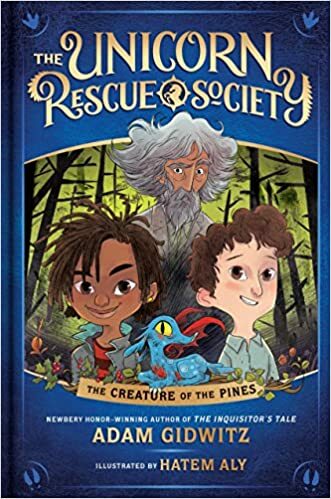 Fans of The Magic Tree House may find this a fun series to try for a change of pace; it’s right around the same reading level. The Branches books always find a ready audience in my libraries. Cons: As much as I love Wendy Mass and want to praise everything she does, this is a little too close to The Magic Tree House. A bookish brother and his slightly younger adventurous sister travel back in time. Seems like Scholastic could have tried a bit harder for originality. Summary: Aru Shah lives with her mother, director of the Museum of Ancient Indian Art and Culture. Aru has a hard time fitting in at school, so when three somewhat nasty kids from her class show up at the museum on a vacation day, Aru can’t help showing off. She lights a lamp her mother has warned her never to touch, and unleashes the Sleeper, an evil being who freezes time for everyone around Aru. 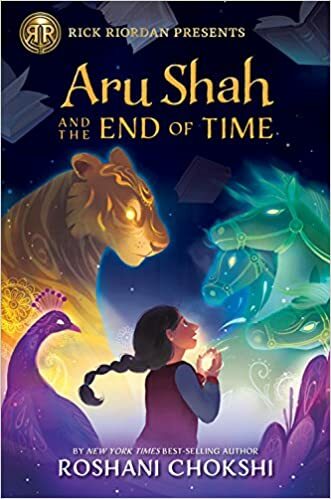 To undo the spell, Aru is sent on a mission, where she learns that she is a reincarnation of one of the Pandava brothers from Indian mythology. She meets up with Mini, a girl who is also one of the Pandava, and together they manage to defeat a large number of monsters and other mythological beings to fulfill their quest. It’s clearly not over at the end, though; two mysterious new kids are introduced, and it looks like Aru will be off on another adventure in April 2019. Includes an extensive glossary of Indian mythology. 368 pages; grades 4-7. Pros: This is the first book in the new Rick Riordan Presents imprint of Disney-Hyperion (the next two, on Korean and Mayan mythology, are due out in September). The format is similar to Riordan’s books, with a misfit protagonist who discovers her demigod status and has a string of adventures with mythological creatures. It’s sure to be a hit with Riordan’s legion of fans. Cons: Having no background in Indian mythology, I struggled to keep track of the many different characters and their relationships with one another. Summary: From the team that brought you The Inquisitor’s Tale comes this new series for the early chapter book crowd. Elliot Eisner is bummed to be starting school three weeks into the school year. That ends up being the least of his concerns after he meets a girl named Uchenna. The two of them get paired up on what turns out to be the weirdest field trip he has ever been on. Their class travels to New Jersey’s Pine Barrens with their chronically flustered teacher Miss Vole and the strange and perpetually grumpy Professor Fauna. They wind up rescuing a small dragon-like creature that turns out to be a Jersey Devil. After they return to school, the creature gets loose and ends up in the home of the evil billionaire Schmoke brothers. Elliott and Uchenna are forced to seek out Professor Fauna for help. The rescue complete, he invites them to join the top secret Unicorn Rescue Society, setting the stage for more escapades with mythical creatures in the next books of the series. 192 pages; grades 3-5. Pros: A unique and promising start to a new series, with plenty of deadpan humor, one-of-a-kind characters, and magic action. Short chapters, a fast pace, and plenty of illustrations will appeal to reluctant readers. Cons: As a New Jersey native, I would have appreciated some back matter about the Jersey Devil. If you’d like to buy this book on Amazon, click here.